Comes in your choice of gold, cherry, or light oak frame. Standard shipping is $25.00. Also available unframed (matted only) for $98.00. Note: The oval mat cuts pictured above are no longer available; they are now rectangles. "Do not weep! 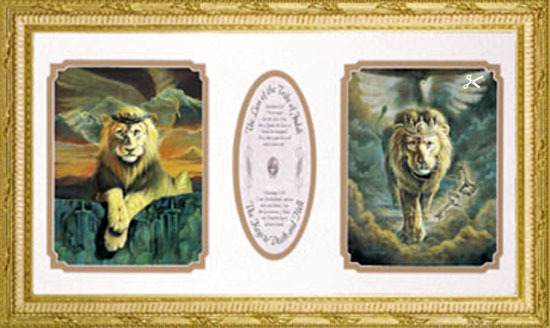 See, the Lion of the tribe of Judah, the Root of David, has triumphed." He is able to open the scroll and its seven seals. "I am he that liveth, and was dead; and, behold, I am alive for evermore, Amen; and I hold the keys to hell and of death." 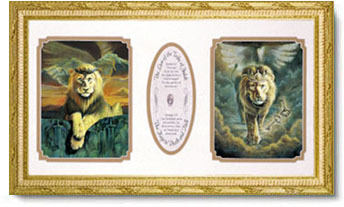 Lion of Judah & Keys to Death and Hell copyright© by William Hallmark.